The most common reasons software development projects fail and the seven keys you, the buyer, will need to overcome them. How to manage the key aspects of your project under your control to ensure that your project is successfully executed by your IT service provider’s team. How to stay involved in your project’s planning and development process to minimize risk and keep your project on track without becoming an obstacle to the IT team’s implementation. How to set the right expectations and ask the right questions of your IT service provider. 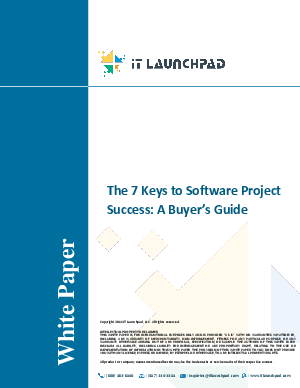 This white paper will get you acquainted with the key factors that frequently lead to unsuccessful software development projects and the proper planning, involvement, and communication necessary between you and the IT service provider to maximize your project’s potential for success.